Centurion are nice round globe shaped bulbs supplied as a 14/21cm seed bulb. They have an excellent flavour and will store well for later use. This is a lovely red skinned onion which is a very strong grower. Red Brunswick is one of the older varieties available but has stood the test of time still producing nice round bulbs. A superb variety which is a strong grower and matures very well. Grow in full sun, in soil that has not been freshly composted. Stuttgarter Giant are slightly flat seeds supplied as a 14/21cm bulb. They have an excellent flavour and store well for later use. This shallot is a very heavy cropper and will store for a number of months if kept in a cool airy place. 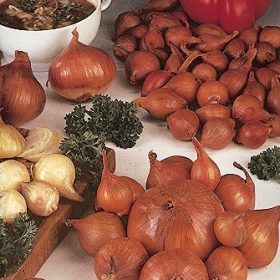 The skin colour of this shallot is red as the name suggests and as such they are ideal for using in salads.